Henry Roeland Byrd was a tap dancer, card shark, soldier, cook, laborer and general street hustler. 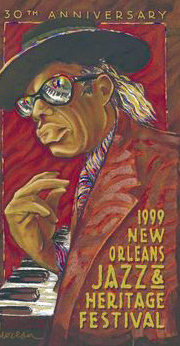 He also was one of the greatest New Orleans piano professors of all time – Professor Longhair. His iconic “Tipitina” inspired the likes of Fats Domino, Allen Toussaint, James Booker, Dr. John and countless others. Fess was there at the beginning of the New Orleans Rock and Roll era in New Orleans, cutting his first singles in the J&M Studio (Cosimo Matassa) in 1949. And in November 1953 with Alvin “Red” Tyler, Lee Allen, Earl Palmer, and Edgar Blanchard backing him up, he recorded “Tipitina” for the first time. 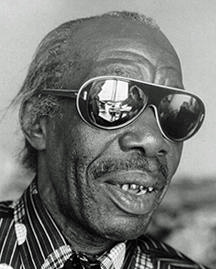 Born in Bogalusa but raised in New Orleans, Professor Longhair never made the hit parade and never really experienced financial success. By the late 60’s, his career had folded and he was living in poverty. In 1970, Quint Davis and Alison Minor sought him out with the intention of getting him to perform at their fledgling music festival, the New Orleans Jazz and Heritage Festival. Who they found was a frail, weak man who didn’t seem capable of pounding out his trademark rhythms. But with the help of Davis and Minor, he recovered enough to perform at the second JazzFest in 1971 and demonstrate that, if anything, his playing had gotten better. His hometown and the world embraced him and his career flourished. Until his death in 1980, he recorded and performed, including at the nightclub created for the purpose of providing him and other aging R&B artists a place to play, named appropriately Tipitina’s. Join me, won’t you for some Fess and Fess-inspired music this Memorial Day. Sweeney’s Gumbo YaYa kicks off at 10 a.m. on Monday. Here’s a recording of that show on Mixcloud. This entry was posted in New Orleans Performers, New Orleans Piano Players and tagged Allen Toussaint, Dr. John, Fats Domino, Henry Roeland Byrd, James Booker, New Orleans, Professor Longhair, Tipitina's. Bookmark the permalink.